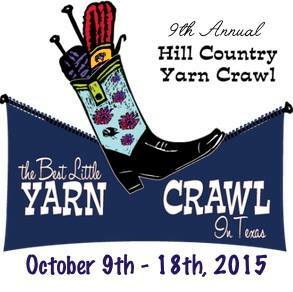 This year's crawl runs from October 9th -18th and covers 14 fiber shops across the central Texas. Participants purchase a "passport" for $10 that does include a bag - and they are on their way! Each shop they visit will give them a stamp in their passport, two free patterns, and chance to win store prizes. Each shop also offers a discount on a selected yarn for the Crawl. For 2015, there are also special events happening at the shops throughout the Crawl. For example, at The Tinsmith's Wife will be having a podcast and showcasing two great independent dyers at the shop on Saturday, 10/10 and don't miss a visit by another dyer there on 10/11 with a Carnival atmosphere! 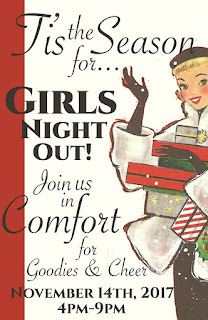 The Comfort Crockery is also having wonderful happenings! 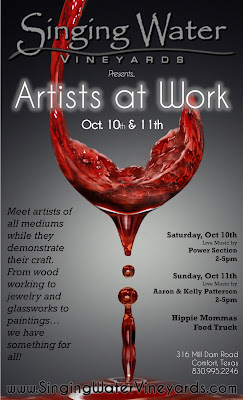 Singing Water Vineyards will host a 2-day event featuring artists at work, live music, wine and food. From jewelry to wood working and glass works to painting...we'll have something for everyone! Saturday's live music by Power Section 2-5pm. Sunday's live music by Aaron & Kelly Patterson, 2-5pm. 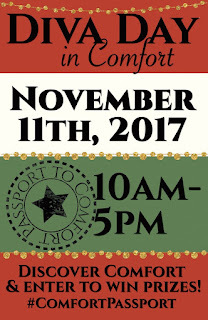 Hippie Mommas will be serving up "Comfort Food" 12-5pm.